To see the latest Cobra golf clubs, please visit our Cobra drivers and Cobra fairway woods pages. The new Cobra AMP series mixes new design improvements with the quality features that have made Cobra a leader in golf equipment. The series is named for the new Advanced Material Placement in the irons, which has been developed and tested to maximize performance. Buy the Cobra AMP Driver Now! The Cobra AMP Driver features E9 Face Technology with a new canted bulge. The bulge's Dual Roll design promotes distance for shots hit above and below the centerline. The AMP Speed Tuning configures the amount of Dual Roll, head and shaft weight, and length according to each loft for optimized performance. 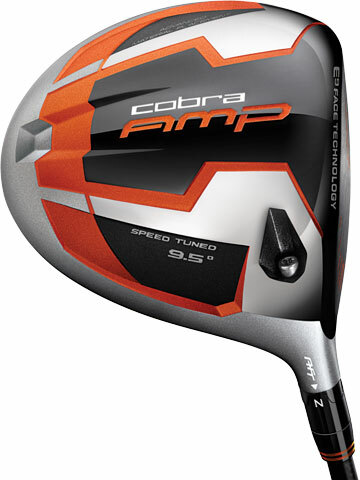 The AMP Driver also uses Cobra's Adjustable Flight Technology. This feature gives you the options of an open, neutral, or closed face so you can improve distance and accuracy according to your playing style. The Aldila Rip Speed Tuned Shafts include progressive weight and El flex profile options to work with your swing speed. Buy the Cobra AMP Offset Driver Now! The Cobra AMP Offset Driver offers the same E9 Face Technology and Dual Roll and the same AMP Speed Tuning as the standard AMP driver. However, the Offset Driver is engineered to minimize slices with its more compact, squarer shape. It also has a Crown Alignment feature to help improve your accuracy. Buy Cobra AMP Fairways Now! The Cobra AMP Fairway Woods have the E9 Face Technology, Dual Roll design, and AMP Speed Tuning technologies that the drivers have. This gives them the same advanced performance that you've been looking for. Buy Cobra AMP Hybrids Now! Each of the Cobra AMP hybrids has a 455 Maraging High Strength Steel face that with a deep position for a stronger, penetrating ball flight. The hybrids also have the same Adjustable Flight Technology featured in the driver. With your choice of open, neutral, or closed face positions, you can work with your own technique to create longer and more accurate shots. Buy Cobra AMP Irons Now! The Cobra AMP Irons have a new mid-width V-Skid sole that tapers at the toe and heel to promote precision with greater distance. The irons also have E9 Face Technology, which enhances distance and forgiveness with its progressive face and cavity design. The AMP irons' standout feature is their Advanced Material Placement, a strategic weight system that positions weight for greater consistency in the short irons and more powerful long irons. The multi-alloy design also includes a full-cavity TPU layer that dampens vibration for a better feel. The AMP series also has a modern multi-finished construction with brightly colored accents. Its modern look is a perfect complement to its advanced technical design. With all of these features, the AMP line gives you everything you need to take your game to the next level.